Our posts to this blog are seasonally sporadic, by which I mean they are sporadic in the summer, winter, spring and fall. We are trying to be more frequent in our efforts, but we are also both busy enough that it is assigned a much lower priority than we may otherwise like. Besides, it’s not like anyone we know relies on this blog as a source of news about us. I was going to use this post as an opportunity to write about the new Batman movie, but an event in our lives has trumped all else, and it’s only proper for me to describe that, instead. The story actually starts in 2005 when Sasha, our pet dog (and child substitute), tore the anterior cruciate ligament on her left rear leg as she was running in from the backyard. I watched it happen: she stepped in a gopher hole, let out a little yip, and came hobbling toward me on three legs; her ears were back in pain and worry. That misstep led to a visit to the vet, followed by X-rays, surgery, hiding antibiotics in treats, and weeks of recovery. We spent more than a few worried hours, laughed a bit, cried a bit (figuratively speaking – I don’t remember shedding actual tears, and it’s safe to say that if I didn’t, The Wandering Moose didn’t either), and lightened our bank account. It felt like a long and frustrating experience, although ultimately everything worked out fine and Sasha made a complete recovery. She even grew back all the fur on her hindquarters after a year or so, which was nice because they shaved her entire leg and hip for the surgery, leaving a bare turkey-leg shaped patch of skin. T.W. Moose had been very pessimistic about total regrowth ever happening, but it did. That meant we had a little better understanding of what it meant when she pulled up into another three-legged hobble a few weeks ago. Once again, she was running in from our backyard (which is apparently much more dangerous than I realized) when she stopped at our deck stairs in obvious distress. I did not see it happen this time, but the leg held up close to her body – the right leg this time – and pinned back ears were telling. A visit to our veterinarian the next day confirmed it: another torn ACL, so she would have a matching set on her rear legs. We had been told the first time that ACL surgery was pretty common in dogs, and now we found out that if the first one should go out, it increased the odds of the opposite leg tearing in the future. 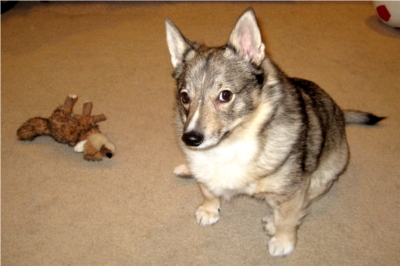 Sasha is a Swedish Vallhund, which is a rare enough breed that most people have either never heard of it, or they pretend they have and we don’t believe them. We are not certain if knee problems are common with the breed (from our experience: yes) but she has an unusual physiology. 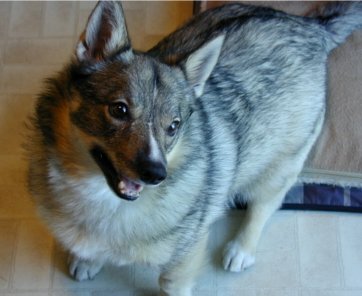 Swedish Vallhunds have thick, muscular bodies with short legs, and were initially bred for herding cattle and riding on Viking ships. One could build a fairly accurate model of Sasha by taking a large bratwurst and two toothpicks, then breaking each toothpick in half and sticking them in the bratwurst as legs. Anyway, the surgery was scheduled for a week later (something about letting the blood drain from her knee); it went very well, and we brought her home the same day. After her first surgery we struggled with keeping her bandages in place because of the rather drastic taper in her short legs. It was no different this time, and she had her wrappings off before even leaving the animal hospital. We probably should have taken this as a bad omen, but Sasha had been good not to bother the surgery wound the previous time, so the vet decided she would be okay to go home without bandages. I swear, I wasn't playing with that toy. Almost at once she was busy licking her newly shaved leg and trying to “investigate” the stitches. But, it was still the first night, and she was a bit strange and unsteady after the procedure, so we hoped it was just an effect of the anesthesia. 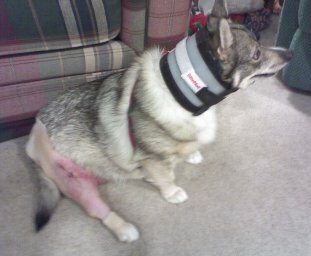 Regardless, we found some bandages and covered her leg ourselves, hoping for the best. Everything went okay for the first two days. We were each coming home from work for lunch, so she was never alone for more than a few hours. She always managed to remove one layer of her bandages, but there was a final, untouched layer that was keeping her from the area. Then, on the third day after her surgery, T.W. Moose came home to find all the bandages gone and the stitches completely torn out. To complicate matters, our vet’s office is closed on Thursdays and, of course, Sasha had thoughtfully chosen a Thursday to commit her crime. Now, there may be someone reading this who can’t believe the stupidity of T.W. Moose and me at this point for not putting an “Elizabethan collar” or “E-collar” (one of those cone things) on Sasha so she couldn’t bother her leg. They probably figure that we are too indulgent of our dog and don’t want her to be unhappy with us, so we leave it off. They would probably tell us that we simply have to make her wear it and tolerate her bad mood, because tearing stitches out is too great of a concern. I suspect this is true, because we have heard as much before, from several different sources. The second reason is: even if we can get the collar to stay in place, Sasha does not tolerate it. I don’t mean she hangs her head and looks sad, but she tears around and throws herself against walls trying to get it off. It is quite scary to watch as over-indulgent dog “parents,” because it looks the entire time like she is going to hurt herself even further; keeping in mind that she only has three good legs to work with. It may be that if we could just leave it on she would learn to tolerate an E-collar, but because both of us work, we have to be able to leave her alone for a few hours at a time. So T.W. Moose found herself with a bit of a problem. Not only had Sasha pulled off her bandages and torn out her stitches, but she seemed to have eaten the bandages, and the vet’s office was closed. She called our vet’s emergency contact, which is a different facility called Central Valley Veterinary Hospital , and explained the situation. Fortunately, Central Valley was able to get us in before their Extended Care hours, which ended up saving us a bit on the bill. From this point, the story takes a happy turn. The people at Central Valley were fantastic, and very helpful. The doctor there put a dozen staples in Sasha’s leg, which they could do without having to put her under, and told us about a product that would make all the difference: a BiteNot Collar. It functions like a whiplash collar for a human and simply restricts her from moving her head from side to side. There is an additional buckle system that straps under her forelegs to keep everything in place, negating the “torpedo effect” so Sasha can’t pull it off. It looks uncomfortable, but I don’t believe it is, because Sasha is tolerating it surprisingly well; certainly much better than an E-collar. We keep it on her night and day, and she gives us dirty looks from time to time, but it provides us with peace of mind when we are sleeping or at work (and contributes unexpected comedy relief to the whole drama). We also found a little clump of digested tape and gauze on the lawn last night, which resolved our last major concern. The vet believed the amount of tape and gauze she ate could have created a blockage in her intestines that would have become a surgical emergency. But, fortunately for Sasha, all of her systems seem to be working properly, she is living in patience with her restraining collar, and the staples come out in three days. Sasha’s ACL surgery has been a very different experience this time around. We worried less, perhaps, but had more frustration and greater expenses. The moral of the story: Sasha is never, ever running in our backyard again. Wow, what a touching story. I kinda pictured myself there, with the collar incident. Just cause a vet is a vet, doesn’t mean they know more about the character of your dog than you do … but alas. Sasha scored one for the team though. The leg looks painful and not at all dog-lady-like, but if she takes it with grace, then that is all that there is to it. Aww, poor baby. Let’s hope the fur grows back before next year this time! We are keeping our fingers crossed that it will grow back quickly this time, but I don’t really believe it will happen. Sasha doesn’t seem to mind it anymore, but she was not happy about the bare skin at first. Of course, she can’t exactly get to it. I guess the final test will be this Saturday, when we take the collar off. so, the collar’s off now? how did it go?! And how is the patient? She is doing very well without the collar, thank you for asking! She is happy to be able to bend her neck again (or, at least, we think she’s happy to be able to bend her neck again). Wow – quite a story! I (like Kerim) pictured myself there. However, I pictured myself wearing the collar. hah. Hope all is well. Nate!!! This is Jess (Farmer)Mathes. Remember me I hope? I saw your blog on Phillip and Amie’s and I couldn’t resist taking a peek. And then I got to read about your poor dog! Who is very cute by the way. I’m glad the story ended well – I was worried at first. The things we go through for our pets!!!! Anyway, it was fun to see your blog. I hope you and Amy are doing great!!!! Hey Jess!!! Of course I remember – how could I possibly forget? It’s great to hear from you, and Amy and I hope you are your family are doing really well! Thanks for your thoughtful comments about Sasha, and she is doing pretty well now. She just needs some recovery time (and fur-regrowing time) and everything should be good. Do you guys have any sort of blog that we could check in with you? boy, you guys aren’t kidding when you said your posts were seasonally sporadic! Wow Nate, great job! You angered Mom and with the Holiday season around, that is never a good thing. Better get some posts out soon! Wow! What a touching story. I was crying for most of it.Thanks for sharing that with me. As the owner of two boxers, I have been to an emergency vet in salt lake a few times myself and it is always a scary situations.